In 2016 I was hit by a truck and that ruined my old 1996 GT road bike, so after 20 years, I guess it was time to get a new one. I went to every bicycle shop within about a 20 mile radius looking for something new that I really liked and had a good price. Then I decided to just make something new. So I researched parts, and started ordering. I got a bunch of full carbon fiber parts from the FlyXII factory including an F905 frame & fork for around $400. 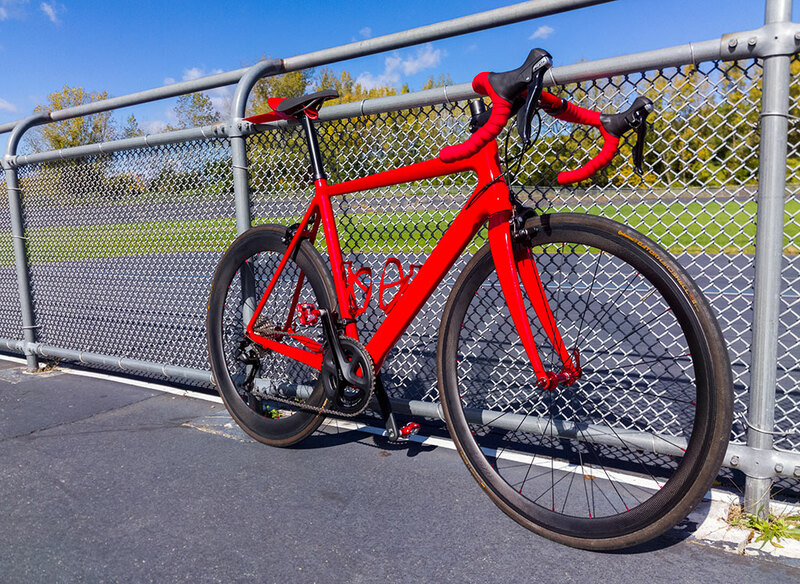 I also got a Shimano 105 groupset for about $400 from Chain Reaction Cycles and a full carbon custom wheelset (with red hubs) from Baixiang Bike for another $400. 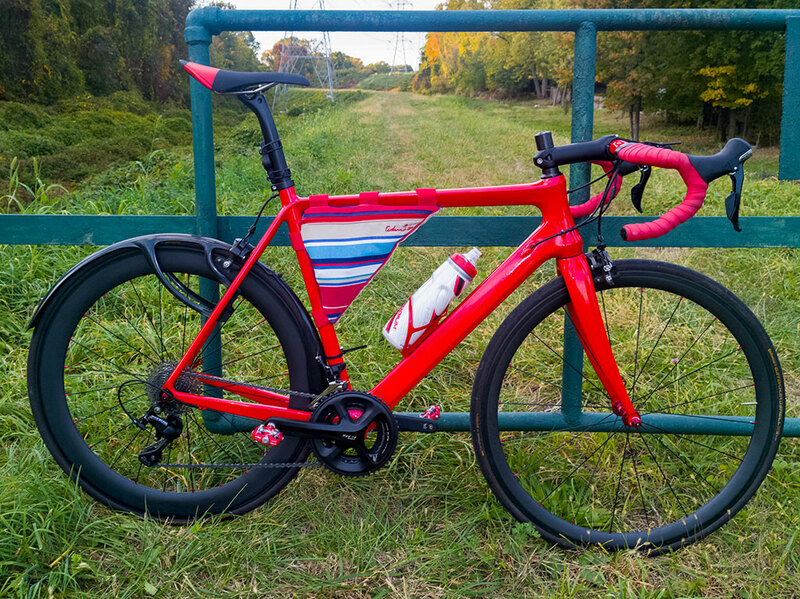 Bruce Risely in New Jersey painted my carbon frame and other parts with a nice Ferrari red and blue pearl finish. 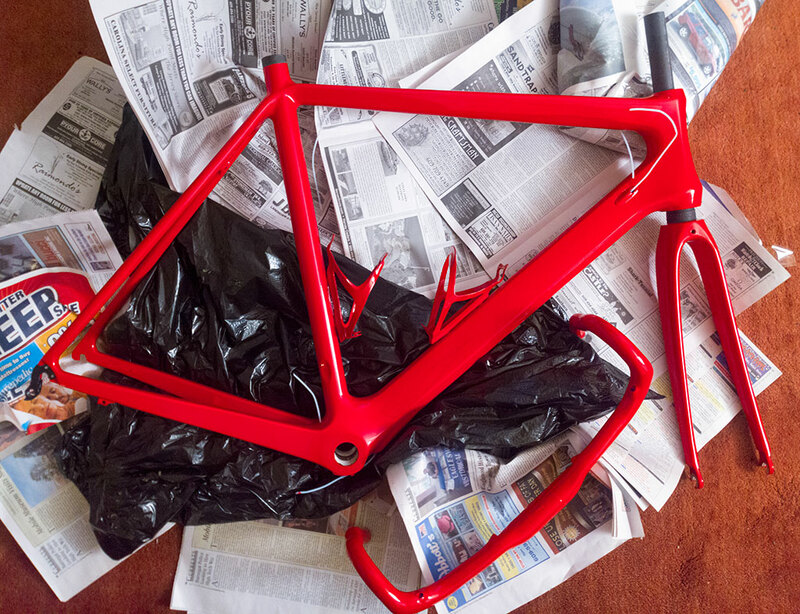 Obviously, I couldn't just leave the parts looking like raw carbon. Expert mechanic, Bob Flint of Hastings Velo put it all together matching my fitting measurements. Then in 2017 for the bike's 1 year birthday, Meegan made a custom frame bag for carrying tools, spare tube, snacks, phone, etc. There's a single large pocket and then a secondary small pocket on the other side. It even has my name embroidered! Here I am in my urban warrior clothing. I got the polypropylene base layer on, along with illuminite tights, long sleeve coolmax jersey, illuminite jacket, neoprene gloves, Rockhopper shoes, thermal balaclava, and a helmet with a windshield. 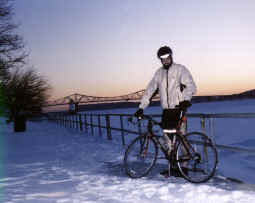 Mr. Tripod took this picture at a park just north of the Tappan Zee bridge on the Hudson River. You can see the bridge there behind me, and the river is a bit frozen. Yes, I was bicycling at night, which is why I've got the reflective jacket and tights on. Normally, they appear black, but since I had the flash on.. I'm glowing. The bicycle also has a 15W NiteRider halogen NiMH lamp (the battery's in the frame pouch) and a blinking red taillight. 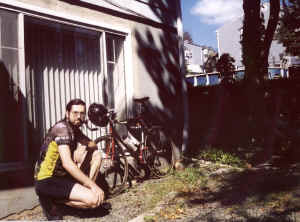 Here's a picture of me outside my first New York inhabitance around 1999. My bicycle is a red 1996 GT Force with custom built Mavic CXP 30 wheels. It's also got clipless pedals and whatnot. In contrast to the above photo, this was more of a warm Fall day. Often, I keep a Win CE PDA (along with a first aid kit, spare tube, tools, battery, etc.) in the frame pouch for electronic mapping. 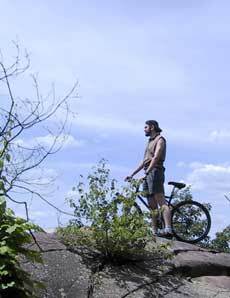 Here's a good picture of me mountain biking in Bethany, CT around 2000 with my buddy Garrett. We rode to the top of this mountain-like hill cliff thing which usually we yell at from the other side of the lake below. In case you're wondering, yelling at the lake from the top of the mountain does NOT produce an echo.